Located in Logan Square, Puebla Restaurant & Taqueria. 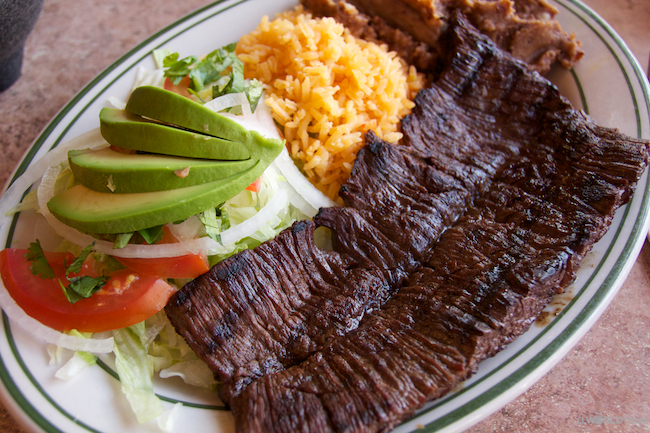 Puebla Restaurant & Taqueria has been serving Logan Square since 1992. Since then, owner Maria Banda has been serving traditional foods of Puebla by visiting Mexico twice a year and bringing back authentic dishes. Puebla's main purpose is to bring guests from the Chicago area where everyone could come together to experience the unique flavors, along with the art and culture of Mexico – all in a casual, authentic setting. Two scrambled eggs with onion, tomato and jalapeño pepper. Dark broth flavored with pasilla chile, avocado, melting cheese, porkrind, thick cream, and crisp tortilla strips. Served with lettuce, tomatoes, beans, sour cream and guacamole. Served with beans, lettuce and tomatoes. Three rolled tortillas stuffed with chicken or chihuahua cheese and topped with our deliciuos mole poblano sauce, sour cream and melted chihuahua cheese. Three rolled up tortillas stuffed with chicken, cheese or ground beef and topped with our mild tomatillo sauce and melted chihuahua cheese. Three rolled up tortillas stuffed with chicken, cheese or ground beef and topped with our tomato sauce and melted chihuahua cheese. Three folded over corn tortillas filled with chihuahua cheese. Three home made corn meal tamales filed with meat. Rolle flour tortilla stuffed with your choice of steak, roast pork, chicken, ground beef, or avocado. Garnished with refried beans, lettuce and tomato. The following orders are served with refried beans, spanish rice, salads and your choice of corn flour tortilla. Chopped ribeye steak, simmered in exotic chile de arbol sauce. VERY HOT! Call (773) 227–5499 from 10a – 10p daily, or book online with OpenTable.